Tea Happiness- A blog on tea drinking, tea history, tea industry interviews, NYC tea experiences! : Vote For The World Tea Awards 2017! Vote For The World Tea Awards 2017! We're nearing the 2017 World Tea Expo (June 13-15) and part of the festivities is the World Tea Awards honoring achievements in the tea industry. The voting is now open, and you can nominate your favorites in many different categories such as Best Tea Publication, Best Tea Health Advocate, Best Tea Blog (wink, wink! ), and Best Tea Community Level Campaign/Program just to name a few. Of course, you should vote for your favorites in every category, but I wanted to bring your attention specifically to the Best Tea Community Level Campaign/Program category. A program, initiative or group that promotes either the enjoyment of tea consumption and/or in some focused manner the well being of those involved in the supply chain of tea. This category is dear to me not just as a member of the group, but because it has been such a source of inspiration and support. 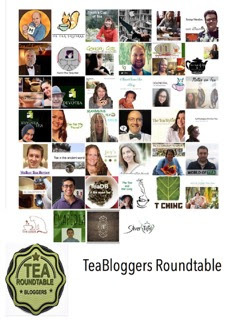 Last year our Tea Bloggers Roundtable (TBR) was nominated for a World Tea Award which was a huge honor. We want to be sure to get nominated again this year, and I hope we can win! To get the word out, I wanted to highlight what the TBR is, and why we deserve a nomination. The TBR is an international community of tea bloggers. We all have different interests in tea with different areas of knowledge and study, and most of all we share our passion for tea with our readers. Through tea reviews, interviews, informational posts and videos, stories, and adventures, we promote the enjoyment of tea drinking to the world. Many bloggers have even organized festivals, classes, and tastings. We discuss tea culture and rituals from all over the world. To learn more about each blogger in the community, visit our website. You may even discover a few bloggers you didn't know before! One of the other things we do, is support each other. We ask fellow bloggers for feedback, answer each other's questions, support bloggers' initiatives...we really are like a big family. I've received so much support from fellow bloggers, it's been a huge positive influence in my life. We have meetups with local tea blogging friends and we do online hangouts as well. Every blogger I've met has been welcoming, supportive, and kind. We all just want to share our love for tea as much as possible. So I urge you to take a few moments of your time to vote in the 2017 World Tea Awards, and please keep the Tea Blogger Roundtable in mind. To vote, you can visit the Expo website HERE, after reading the categories, be sure to scroll down to the bottom to access the nominations page. Thanks to everyone for your support! It is truly appreciated.